The Radial Revere 1.1 Apex slips in under a grand, but can it hit the mark at this very competitive price point? Radial Cycles may be less than a year old, but with a huge range of 33 bikes across all disciplines, there are plenty of different machines to choose from. After having a look at the entry-level Radial Revere 2.1 a couple of months ago, it was time to move up the range to this, the Radial Revere 1.1 carbon. Sitting alongside the disc brake-equipped Espire and the aero Attune, the Revere is intended to fit in as a do-it-all carbon all-rounder; a generally good bike rather than something intended to specialise in one sort of riding or another. At the heart of the Radial Revere 1.1 is a Toray carbon-fibre frame. Although the bike is designed and built in the UK, the frame is produced in Taiwan – although this certainly shouldn’t be seen as a negative given that the vast majority of bikes costing four or five times as much also have their origins in the Far East. A carbon frame on a bike that costs a penny under a grand is unlikely to provide a spectacular ride, but that doesn’t stop the Radial Revere 1.1 managing to make the grade as a good bike. It might not be the lightest, stiffest or most aerodynamic bike on the market, but Radial has put together a strong all-rounder that is a good choice for a solid first road bike. What most impressed me was the comfort of the frame, which made getting in the miles on the sub-standard lanes of Kent and Sussex much less of a drag than it has been with a number of other often more expensive bikes I’ve been riding recently. Obviously if you hit a crater-sized pothole then you quickly know about it, but the level of compliance, particularly in the rear end, really helps to take the buzz out of rough roads. I was also taken by the stable handling of the Radial Revere 1.1. Ok, if you’re looking for a bike to deliver you to victory in a super-technical criterium, this probably isn’t it, but for normal riding the Revere does an admirable job. Handling is smooth and stable and I was able to swing into sweeping bends with the same confidence as I would with my own bike. Of course with a bike of this price there is a slight sacrifice when it comes to bottom bracket stiffness, and when you really stamp on the pedals on the sprint for the town sign there is a small amount of flex noticeable, something which might be more of an issue for larger riders. However this really isn’t an issue for 99 per cent of the time, so it’s hard to really protray this as a negative. 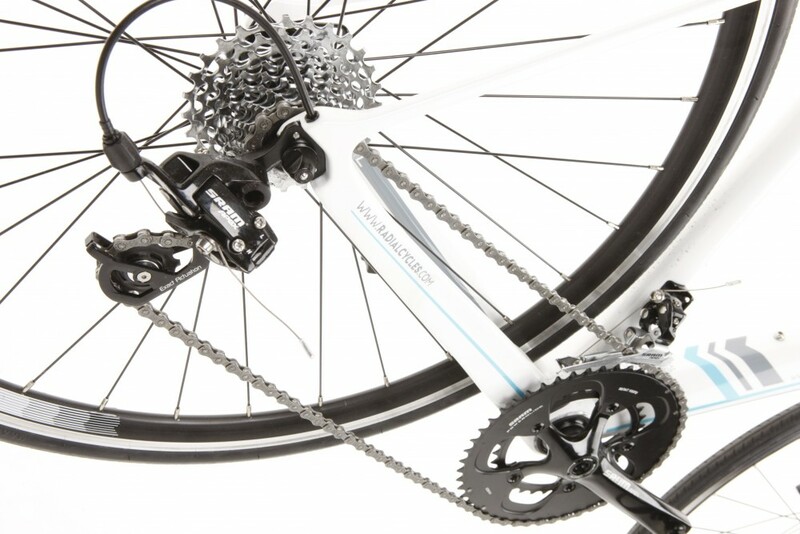 For me the biggest let down with the Radial Revere 1.1 was the choice of SRAM Apex groupset. This was my first time riding Apex, and I have to say I wasn’t best impressed by SRAM’s entry-level option. When it was launched, Apex’s USP was the wide range of gears available, something evident with the 11-32 cassette attached to the Revere. However Shimano catching up, and now offering 32t cassettes and accommodating derailleurs on everything up to Ultegra, the focus has turned to Apex’s shifting performance. Put simply, compared to the smooth, precise, and only marginally more expensive Shimano 105, Apex doesn’t stand up well. Changing gear at the rear is reasonable, if not crisp, and you can always really on finding the gear you’re after, although I admit to being a little timid when shifting under load. However at the front, things aren’t quite as good. Shifting from the big ring to the small ring is easy enough, but going the other way requires a very heavy action, pushing the lever inwards and holding it there for a second or two just to make sure. If your budget can stretch that far, it is really worth considering spending an extra £300 on a Radial Revere 1.1 equipped with Shimano 105. 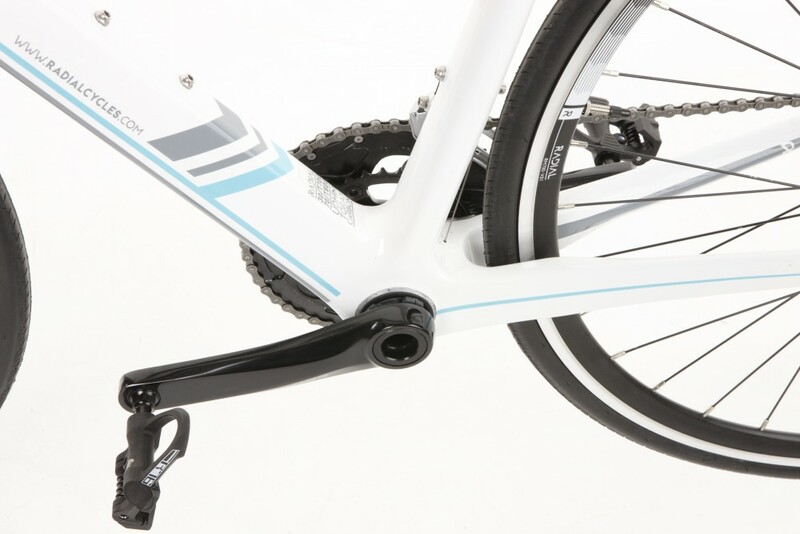 The Apex version of the bike comes with Radial’s own wheelset (the 105 version includes an upgrade to Easton EA70 SL). Obviously keen for the Revere 1.1 to sneek in under the golden £1,000 price point, these are best described as “sturdy”. Their weight (close to 2kg for the pair) does impede acceleration a little, but for rough British roads they seem a sensible choice. For more details visit the Radial website. 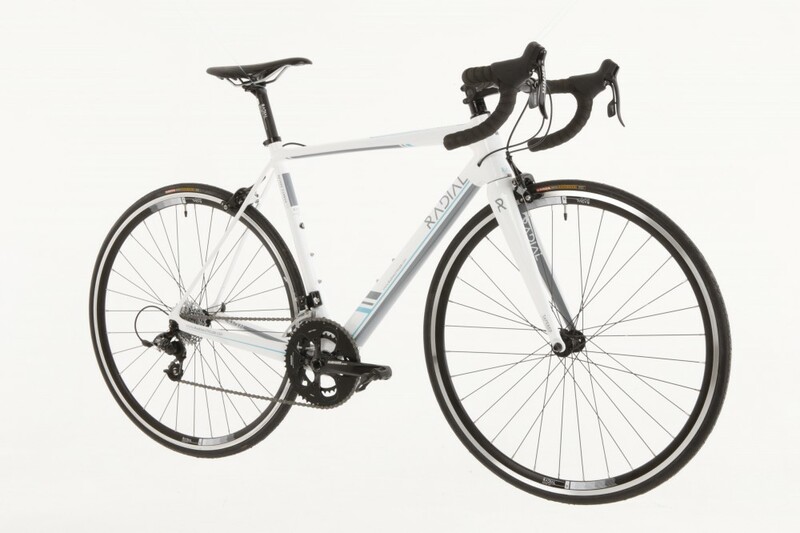 For a penny under a grand, the Radial Revere 1.1 is a solid choice for a first road bike. The handling is stable and the ride comfortable, if a little unspectacular, although I was quite disappointing with the SRAM Apex groupset.